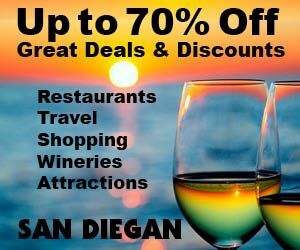 Visiting the wineries in Temecula is only the tip of the iceberg, when it comes to discovering all that the thriving city of Temecula and the Temecula Valley has to offer. So, whatever you do, don’t miss a visit to Temecula Valley in Riverside County. Temecula is less than an hour away from downtown San Diego via I-15. If you live in Escondido, it’s only 16 miles away. No matter what, it’s definitely worth the trip! 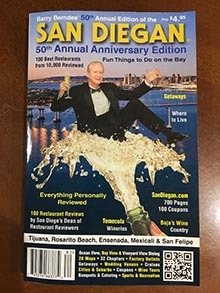 It’s also home to dozens of fabulous restaurants, which are featured in the Where to Dine section of the Temecula Wineries chapter. Their locations can be found on the map in this chapter. Also see the Restaurant & Suburb Specialty Index on page 336 for an in-depth review of each restaurant. This growing community attracts people and businesses from throughout the United States because of its small-town charm, sense of community, and broad range of new housing prices ($465,500 median). With so much to offer, Temecula Valley is an ideal place to live, work and play. For more information visit www.cityoftemecula.org. Historic Old Town Temecula is an authentic western town with buildings dating back to the late 1800s. The City of Temecula has completed a $5.5 million project to preserve Teme­cula’s Old Town theme, and they continue to improve and enhance the area. An intriguing attraction is the Imagination Workshop, Temecula Children’s Museum (31) at 42081 Main St. (951-308-6370). The 7,500-sq. ft. museum features a host of educational and scientific exhibits and interactive hands-on areas for children. Nearby, the 1890 era red brick Mercantile building takes on a new vitality. Remodeled and transformed, it is now the 357-seat Old Town Temecula Community Theater (866-653-8696) and provides a permanent home for local theatrical and musical performance groups. Old Town Temecula abounds with fascinating stores and boutiques specializing in antiques, handmade gift items, and western, Native American and early California lore. With more than 640 antique dealers and specialty shops in Old Town, antique collectors will love shopping here! There are also unique restaurants such as the old Swing Inn Café, which has been in operation since 1927. While in town, be sure to see the historical medallions located at the intersection of Old Town Front and Main streets. To learn more about the history of Temecula, visit the Temecula Valley Museum (35) (951-694-6450). It’s located in Sam Hicks Monument Park at 28314 Mercedes St. It’s open Tues.–Sat., 10 a.m.–5 p.m.; Sun., 1 p.m.–5 p.m.; closed Mon. The suggested donation is ($2). Family Day programs are also offered here each month. Call for information. Also in Old Town is the Temecula Stage Stop (34) (951-676-2059), located at the corner of Old Town Front and Sixth streets on the north side. This state-of-the-art transportation center was designed for the convenience of tour buses including the Greyhound Bus Line. Every Saturday at the Temecula Stage Stop parking lot, 8 a.m.–1 p.m., is one of Temecula’s certified Farmers’ Markets. 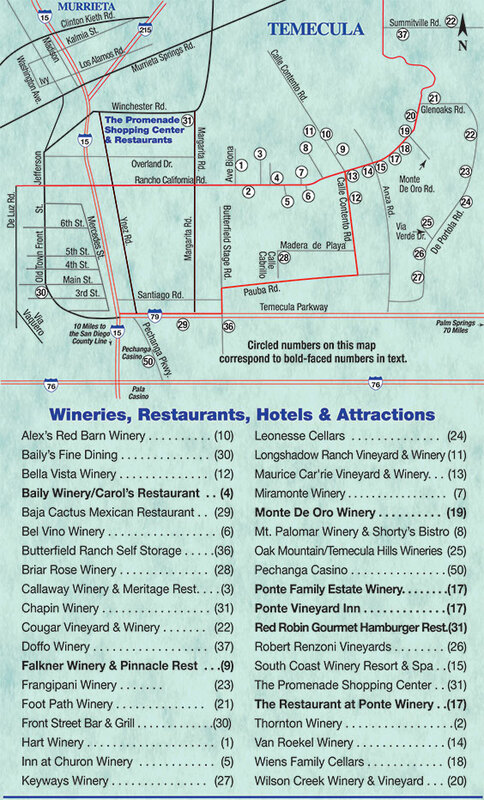 While you’re here, visit the Temecula Wine & Beer Garden (34), featuring Temecula Valley wines (951-506-4474). A beautiful 150-foot-long “history mural” adorns the wall of the adjacent building. Many of the city’s special annual events take place in Old Town Temecula including the spring and fall car shows, featuring hot rods, vintage and classic cars. Call toll-free (866-676-5090). You may also want to visit the recently dedicated Japanese Garden (36) at the corner of Rancho California Road and Ynez Road. This serene and beautiful addition to the Temecula Duck Pond honors their sister city, Nakayama, Japan. Steps away is a beautiful and fitting Veteran’s Memorial to Temecula’s heroes. Temecula is a thriving community. There are new housing developments, corporate parks and shopping centers all around. Plus, it has clean air, a low crime rate and affordable housing. In fact, many families and businesses are moving to Temecula because it offers a unique quality of life that is unsurpassed by any other Southern California community—it has big city amenities and old-fashioned, small-town charm. The city prides itself on its leisure activities and its 41 beautifully landscaped parks and recreational facilities. One of these is the 128-acre Ronald Reagan Sports Park (49), which includes baseball fields, soccer fields, a playground and an all-concrete skateboarding and in-line skating park. Nearby is the $5.6-million Temecula Community Recreation Center (49) (951-694-6410). It houses adult, teen and children’s sports and other recreational programs. This 27,000-sq. ft. center includes a gym, swimming pool complete with a 110-ft. water slide, outdoor amphitheater and rooms for meetings, classes and workshops. And Temecula has award-winning schools. They boast 18 elementary schools, 6 middle schools, 5 high schools, 2 charter schools and 10 private schools. Temecula also provides a business-friendly climate for fast-growing companies. Many businesses have benefited from the city’s Fast Track Program, which allows qualified commercial and industrial manufacturers to expedite projects through planning, saving time and money. Major companies that have relocated or expanded their facilities here include Millipore, Abbott Laboratories, Opto 22, Bostik, Inc., International Rectifier, Milgard Manufacturing, Inc., Professional Hospital Supply and Scotts Company. Having these large companies in the city is healthy for employment opportunities. For further information on relocating your business to Temecula, contact Gloria Wolnick at the City of Temecula (951-694-6444) or the Temecula Valley Chamber of Commerce (37) toll-free (866-676-5090) at 26790 Ynez Ct., Temecula, CA 92591 [www.temecula.org]. The many new home developments in Temecula include luxury condominiums, single-family residences and executive estates. For details, contact the Temecula Valley Chamber of Commerce (866-676-5090). Temecula also has many neighborhood shopping centers. However, the major ones to discover are just off Ynez Road and on Highway 79 South in Temecula. The largest regional retail, dining and entertainment center in the area is The Promenade in Temecula (951-296-0975). It’s located at the southeast corner of Ynez and Winchester roads adjacent to I-15. See map. This partially enclosed, two-level mall has expanded to its current size of 1,139,000 sq. ft. It features more than 140 stores and restaurants including Abercrombie & Fitch and Talbot’s. Anchor stores are JCPenney, Macy’s and Sears. Plus, there is a food court and a story court designed for small children. Just look for the big tree on the first level. They also have a state-of-the-art 15-screen Edwards Cinemas and ongoing outdoor events and entertainment here. In addition, the free-standing stores that surround the mall are well-known, major stores including Barnes & Noble and Costco Wholesale. Temecula continues to bring new and exciting shopping and dining destinations. The attractive Mediterranean-style Bel Villaggio (52) is a retail center with 116,375 sq. ft. of shopping and dining at the west side of Margarita Road just south of Winchester Road. There are several noteworthy businesses among its many attractions and services. Palm Plaza (40) is located on the southwest corner of Ynez and Winchester roads. It’s anchored by a Big Kmart, Food 4 Less, Mervyns, Pier 1 Imports and TJ Maxx. You’ll find additional shops and restaurants are here as well. Tower Plaza Center (48), which is located at the corner of Ynez and Rancho California roads, offers shopping, dining and entertainment in a center of peaceful winding sidewalks, trees and flowers. The center boasts restaurants, Orchard’s Market and various shops, and a SoCal Cinema’s Movie Experience 10. Each September the center is home to the Temecula Valley International Film & Music Festival. Another destination for dining as well as shopping is the Temecula Town Center (41). There are more than 75 stores and restaurants including Claim Jumper, Home Goods, Target and Vons supermarket. With its rolling hills, picturesque landscape and wide open spaces, Temecula is a haven for golf enthusiasts. A course that’s both challenging and beautiful is CrossCreek Golf Club (51) at 43860 Glen Meadows Rd. (951-506-3402) or (800-506-3402). CrossCreek is just minutes from I-15 but you won’t be distracted by any traffic. Designed by legendary golf course designer and architect Arthur Hills, this secluded, pristine golf course is surrounded by rippling creeks and groves of oak and sycamore trees. They were even given four and a half out of five stars by Golf Digest magazine. Green fees are Mon.–Fri. ($40–$65), and Sat.–Sun. ($50–$85). They also have membership packages. The course is 6,833 yards, 140 slope and par 71. There is also a large driving range, putting green, the CrossCreek Grille serving delicious food and drinks and a new clubhouse opening in 2009. CrossCreek is also available for banquets, corporate events and more. As you might expect of this outdoor-oriented community, there is also boating, fishing, camping, hiking and seasonal horseback riding at the nearby Lake Skinner recreation area, 37701 Warren Rd. in Winchester (951-926-1541). The park, which is 10 miles northeast of Temecula off Rancho California Road, has about 300 campsites, many with full hookups, a store and a seasonal swimming pool. Fishing is allowed on the lake as well, and it’s stocked with trout in the winter and catfish in the summer. Also close to Temecula is the Santa Rosa Plateau Ecological Reserve (951-677-6951), which is located at 39400 Clinton Keith Rd. in Murrieta. In this 8,300-acre wildlife reserve are 40 miles of hiking, biking and equestrian trails and wildlife galore. Thirteen of the 40 miles of trails are open for biking and horseback riding. Admission for adults is ($2); children 2–12 ($1). Special group tours and hikes are available. An adventure trip to the Temecula Valley should not be limited to just a tour of the wine country. There is a lot more to see and do here as well. For example, the largest casino in southern Riverside County is only minutes from the wineries. It’s the Pechanga Entertainment Center (50) (888-732-4264), which is open 24 hours a day, seven days a week. It is located off Interstate 15 and Highway 79 south at 45000 Pechanga Pkwy., which is on the border of Riverside and San Diego counties. See Casinos. Just off I-15 at Rancho California Road is the Embassy Suites Hotel Temecula Valley Wine Country (53) at 29345 Rancho California Rd. (951-676-5656). Offered are 176 suites from ($130), fully equipped with refrigerators, microwaves, coffee makers and TVs. With area attractions all within a six-mile radius, it’s a great place to stay! Credit cards: AE, DC, DISC, MC, VISA. Conveniently located in Temecula’s historic Old Town is Ramada Inn Temecula (54) at 28980 Old Town Front St. (951-676-8770). This nice yet affordable motel has rooms from ($80) and all the comforts of home. Credit cards: AE, CB, DC, DISC, MC, VISA. Living in beautiful Temecula Valley, with its welcoming neighborhood, top rated schools and picturesque vineyards, can be a dream come true. The resident experts in Temecula are Jan Leibole and Emily Cavazos of Prudential California Realty (29) at 31093 Temecula Pkwy. Suite D2 (951-694-8111); Jan Liebole’s cell (951-306-5885), Emily Cavazos’ cell (951-757-2910). With more than 13 years of real estate experience between them, Emily and Jan are experts in Southwest Riverside County real estate. They also specialize in Orange County and North San Diego with an emphasis on Temecula Valley. Whether you are a first time homebuyer or a current homeowner looking to upgrade, Jan and Emily will help you through the exciting process of purchasing real estate. They’ll even refer you to a lender if you need help with financing. Plus, they are members of the National Association of Realtors and the California Association of Realtors. Temecula’s historic Old Town, restaurants, hotels and wineries are open year-round for guests. Make it a point to visit Temecula Valley soon!